Dalia, Maria and Soneta enjoying the snow! most of the time outside. We have snow here now and we had a lot of fun playing in the snow! I really don’t understand though why the kids are not wearing their new hats, mittens and scarves because they have them and they are just not using it. It just seems strange to me because it is cold outside and most of the kids aren’t wearing their warm winter wear. I guess they just not used to it but still it really doesn’t make sense to me! 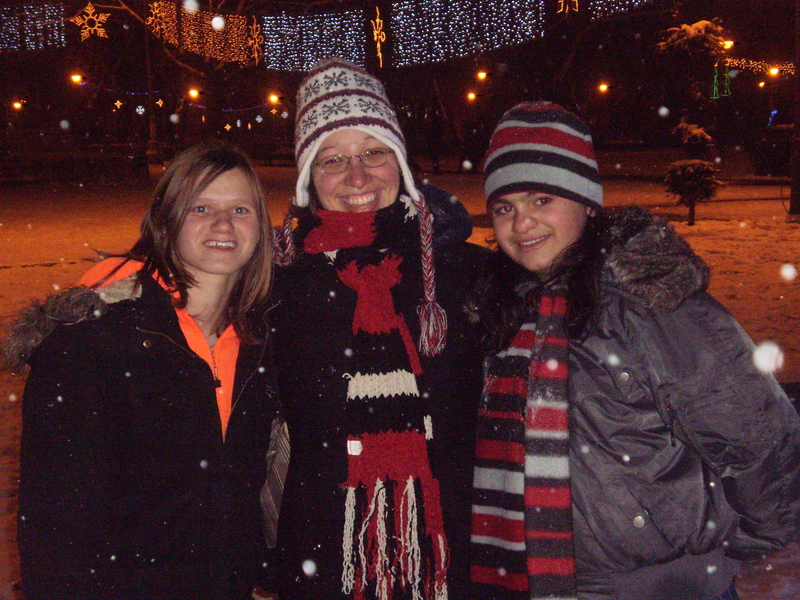 Eva, Andreea and I outside at the park. spaghetti). Before I took them back to the orphanage we went downtown and also to the park which is where all the lights are hung up for the holidays. We had so much taking pictures!! On Wednesday morning I’m going to Timisoara for a conference and Eva will be watching Minnie for me so I needed to give her my extra key and I also wanted to hang out with her and Andreea too.